October is meant for flicks that scare the crap out of you, and Annabelle is right up that road. My all time scariest movie (that I refuse to watch again) is The Conjuring. Even as a grown adult, the first couple of nights after watching it were sleepless. Annabelle has a slight part in the movie The Conjuring, so it makes it a prequel of some sorts. If you haven't seen The Conjuring, it follows two paranormal investigators who help those with supernatural problems. 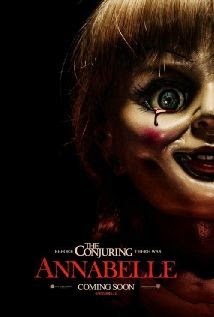 There's a scene in the movie that described Annabelle, hence the prequel..
Annabelle is a possessed doll and in the movie you get to see how the doll becomes possessed in the first place. The story follows a couple who is expecting a baby, Mia (Annabelle Wallis) and her husband John (Ward Horton) who at first live a happy life. Mia collects dolls so her husband gets her the Annabelle doll as a gift. Next thing the audience knows, the doll is possessed. Around the same time, John gets a promotion at his job and they end up moving away. Mia believes that the house was haunted but what she carries with her is the real problem. She gives birth to a beautiful little girl and all is happy for a bit but things get worse and worse. When you see the scary figure you will piss your pants.